The 1938 New England Hurricane (also referred to as the Great New England Hurricane, Long Island Express, and Yankee Clipper) was one of the deadliest and most destructive tropical cyclones to strike Long Island, New York, and New England. The storm formed near the coast of Africa on September 9, becoming a Category 5 hurricane on the Saffir-Simpson Hurricane Scale, before making landfall as a Category 3 hurricane on Long Island on September 21. It is estimated that the hurricane killed 682 people, damaged or destroyed more than 57,000 homes, and caused property losses estimated at $306 million ($4.7 billion in 2017). Damaged trees and buildings were still seen in the affected areas as late as 1951. It remains the most powerful and deadliest hurricane in recorded New England history, perhaps eclipsed in landfall intensity only by the Great Colonial Hurricane of 1635. The storm was first analyzed by ship data south of the Cape Verde Islands on September 9. Over the next 10 days, it steadily gathered strength and slowly tracked to the west-northwest; it is estimated to have reached Category 5 intensity by September 20, while centered east of the Bahamas. It then veered northward in response to a deep trough over Appalachia, sparing the Bahamas, Florida, the Carolinas, and the Mid-Atlantic states. At the same time, a high pressure system was centered north of Bermuda, preventing the hurricane from making an eastward turn out to sea. Thus, the hurricane was effectively squeezed to the north between the two weather systems. This caused the storm's forward speed to increase substantially late on September 20. This extreme forward motion was in the same general direction as the winds on the eastern side of the storm as it proceeded north; this, in turn, caused the wind speed to be far higher in areas east of the storm's eye than would be the case with a hurricane of more typical forward speed. The storm was centered several hundred miles to the southeast of Cape Hatteras during the early hours of September 21, and it weakened slightly. By 8:30 am EDT, it was centered approximately 100 miles (160 km) due east of Cape Hatteras, and its forward speed had increased to well over 50 mph (80 km/h). This rapid movement did not permit enough time for the storm to weaken over the cooler waters before it reached Long Island. The hurricane sped through the Virginia tidewater during the 9:00 am hour. Between 12:00 pm and 2:00 pm, the New Jersey coastline and New York City caught the western edge. At the same time, weather conditions began to deteriorate rapidly on Long Island and along the southern New England coast. The hurricane made landfall at Bellport on Long Island's Suffolk County sometime between 2:10 pm and 2:40 pm as a Category 3 hurricane, with sustained winds of 120 mph. It made a second landfall as a Category 3 hurricane somewhere between Bridgeport and New Haven, Connecticut at around 4:00 pm, with sustained winds of 115 mph. At 9:00 am EDT on September 21, the Washington office issued northeast storm warnings north of Atlantic City and south of Block Island, Rhode Island, and southeast storm warnings from Block Island to Eastport, Maine. The advisory, however, underestimated the storm's intensity and said that it was farther south than it actually was. The office had yet to forward any information about the hurricane to the New York City office. At 10:00 am EDT, the bureau downgraded the hurricane to a tropical storm. The 11:30 am advisory mentioned gale-force winds but nothing about a tropical storm or hurricane. That day, 28 year-old rookie Charles Pierce was standing in for two veteran meteorologists. He concluded that the storm would be squeezed between a high-pressure area located to the west and a high-pressure area to the east, and that it would be forced to ride up a trough of low pressure into New England. A noon meeting was called and Pierce presented his conclusion, but he was overruled by "celebrated" chief forecaster Charles Mitchell and his senior staff. In Boston, meteorologist E.B. Rideout told his WEEI radio listeners (to the skepticism of his peers) that the hurricane would hit New England. At 2:00 pm, hurricane-force gusts were occurring on Long Island's South Shore and near hurricane-force gusts on the coast of Connecticut. The Washington office issued an advisory saying that the storm was 75 mi (120 km) east-southeast of Atlantic City and would pass over Long Island and Connecticut. Re-analysis of the storm suggests that the hurricane was farther north and just 50 mi (80 km) from Fire Island, and that it was stronger and larger than the advisory stated. Due to the lack of technology in 1938, Long Island residents were not warned of the hurricane's arrival, leaving no time to prepare or evacuate. Long Island was struck first, before New England and Quebec, earning the storm the nickname the "Long Island Express." The winds reached up to 150 mph, with waves surging to around 25–35 feet high. The western side of the hurricane caused sustained tropical storm-force winds, high waves, and storm surge along the Jersey Shore and destroyed much of the boardwalk in Atlantic City. The Brigantine Bridge was destroyed over Absecon Inlet between Atlantic City and Brigantine, New Jersey. The surge inundated several coastal communities; Wildwood was under 3 feet (1 m) of water at the height of the storm, and the boardwalk was destroyed in Bay Head and dozens of cottages washed into the ocean. Crops sustained wind damage. The maximum recorded wind gust was 70 mph (110 km/h) at Sandy Hook. The metropolitan area escaped the worst of the wind and storm surge because it was hit by the storm's weaker western side. Winds were recorded at 60 mph (97 km/h) at Central Park, Battery Park recorded sustained winds of 70 mph (110 km/h) with gusts to 80 mph (130 km/h), and a gust of 90 mph (140 km/h) was recorded 500 ft (150 m) above ground at the Daily News Building. Winds were estimated at 120 mph (190 km/h) on top of the Empire State Building. The highest winds were from the north to northwest on the back side of the storm. The storm surge was 8.5 ft (2.6 m) at the Battery and the Mean Low Water storm tide was 16.75 ft (5.11 m) at Willets Point. In New York Harbor, the waters rose 7 ft (2.1 m) in a half-hour. In New York City and Long Island, schools were dismissed early. Extensive street flooding occurred because debris blocked drains. The East River flowed three blocks and flooded a Consolidated Edison (Con Ed) plant at 133rd Street, causing power to fail in Manhattan north of 59th Street and in the Bronx for several minutes to a few hours. Railroad and ferry services were suspended for a time. The Staten Island Ferry boat Knickerbocker got stuck in the terminal with 200 passengers aboard. Bridges and tunnels into Manhattan were closed until the following afternoon. 95% of Nassau County lost power, where floods brought traffic to a halt. In Manhasset Bay, almost 400 boats were ripped from their moorings and smashed or sunk, with more than 100 washing up on the beach by the Port Washington Yacht Club. Similar scenes occurred in other locations on the north shore. The J.P. Morgan estate in Glen Cove was heavily damaged. The wife of New York City mayor Fiorello La Guardia was forced to wait out the storm on the second floor of their Northport cottage. Mitchel Field army airfield was buffeted by winds of nearly 100 mph (160 km/h) and was under knee-deep water. In Williston Park, residents of 50 homes needed to be rescued by rowboat when heavy rain the previous few days combined with the rain from the hurricane to overflow a pond. Eastern Long Island experienced the worst of the storm. The Dune Road area of Westhampton Beach was obliterated, resulting in 29 deaths. There were 21 other deaths through the rest of the east end of Long Island. The storm surge temporarily turned Montauk into an island as it flooded across the South Fork at Napeague and obliterated the tracks of the Long Island Rail Road. Long Island was hit hard being exposed to the storm due to its shorelines. The estimated storm tide was 15 ft (4.6 m) in this region. A mean low water storm tide of 8 ft (2.4 m) was recorded at Port Jefferson. About 50 people perished in the storm's wake. All the shore lines were very vulnerable to the high winds and flooding, and anyone near the shores was directly in harm's way. Ten new inlets were created on eastern Long Island. The surge rearranged the sand at the Cedar Point Lighthouse so that the island became connected to what is now Cedar Point County Park. The surging water created the Shinnecock Inlet by carving out a large section of barrier island separating Shinnecock Bay from the Atlantic. The storm toppled the landmark steeple of the Old Whaler's Church, which was the tallest building in Sag Harbor. The steeple has not been rebuilt. Wading River suffered substantial damage. The storm blew down the movie theater on Front Street in Greenport on the North Fork of Long Island. The fishing industry was destroyed, as was half of the apple crop. The storm surge was especially violent along the Rhode Island shore, sweeping hundreds of summer cottages out to sea. Low-lying Block Island was almost completely underwater, and many drowned. As the surge drove northward through Narragansett Bay, it was restricted by the Bay's funnel shape and rose to 15.8 ft (4.8 m) above normal spring tides, resulting in more than 13 feet (4.0 m) of water in some areas of downtown Providence. Several motorists were drowned in their automobiles. In Jamestown, seven children were killed when their school bus was blown into Mackerel Cove. Many stores in downtown Providence were looted by mobs, often before the flood waters had fully subsided and due in part to the economic difficulties of the Great Depression. A few miles from Conanicut Island, Whale Rock Light was swept off its base and into the raging waves, killing lighthouse keeper Walter Eberle. His body was never found. The Prudence Island Light suffered a direct blow from the storm surge, which measured 17 feet 5 inches (5.31 m) at Sandy Point. The masonry tower was slightly damaged. However, the adjoining light keeper's home was utterly destroyed and washed out to sea. The light keeper's wife and son were both killed, as well as the former light keeper and a couple who left their summer cottages near the lighthouse and sought shelter in what they thought was the sturdier light keeper's home. Light keeper George T. Gustavus was thrown free from the wreckage of the house and was saved by an island resident who held a branch into the water from the cliffs farther down the coast. Gustavus and Milton Chase, the owner of the island's power plant, reactivated the light during the storm by running a cable from the plant to the light and installing a light bulb, marking the first time that it was illuminated with electricity. The original parchment of the 1764 Charter of Brown University was washed clean of its text when its vault was flooded in a Providence bank. Newport recorded the highest water level of the storm, at 3.53 meters above mean sea level according to a NOAA study. This storm level is 0.98 meters above the SLOSH model of a 100-year storm, and one estimate is that this water level "reflects a storm occurring roughly once every 400 years." A study of sand deposits also gives evidence that this was the strongest hurricane to hit Rhode Island in over 300 years. The Fox Point Hurricane Barrier was completed in 1966 because of the massive flooding from the 1938 storm, and from the even higher 14.4 foot (4.4 meters) storm surge that resulted from 1954's Hurricane Carol, in hopes of preventing extreme storm surges from ever again flooding downtown Providence. Eastern Connecticut was on the eastern side of the hurricane. Long Island acted as a buffer against large ocean surges, but the waters of Long Island Sound rose to great heights. Small shoreline towns to the east of New Haven experienced much destruction from the water and winds, and the 1938 hurricane holds the record for the worst natural disaster in Connecticut's 350-year history. The mean low-water storm tide was 14.1 ft (4.3 m) at Stamford, 12.8 ft (3.9 m) at Bridgeport, and 10.58 ft (3.22 m) at New London, which remains a record high. In the shoreline towns of Madison, Clinton, Westbrook, and Old Saybrook, buildings were found as wreckage across coastal roads. Actress Katharine Hepburn waded to safety from her Old Saybrook beach home, narrowly escaping death. She stated in her 1991 book that 95% of her personal belongings were either lost or destroyed, including her 1932 Oscar, which was later found intact. In Old Lyme, beach cottages were flattened or swept away. The NYNH&H passenger train Bostonian became stuck in debris at Stonington. Two passengers drowned while attempting to escape before the crew was able to clear the debris and get the train moving. Along the Stonington shorefront, buildings were swept off their foundations and found two miles (3 km) inland. Rescuers found live fish and crabs in kitchen drawers and cabinets while searching for survivors in the homes in Mystic. Interior sections of the state experienced widespread flooding as the hurricane's torrential rains fell on soil already saturated from previous storms. The Connecticut River was forced out of its banks, inundating cities and towns from Hartford to Middletown. Novelist Ann Petry drew on her personal experiences of the hurricane in Old Saybrook in her 1947 novel Country Place. The novel is set in the immediate aftermath of World War II, but Petry identified the 1938 storm as the source for the storm that is at the center of her narrative. Aerial photo of Marchmont in Winchendon Springs, Massachusetts taken during the summer of 1938. The eye of the storm followed the Connecticut River north into Massachusetts, where the winds and flooding killed 99 people. In Springfield, the river rose six to 10 feet (3 m) above flood stage, causing significant damage. Up to 6 in (150 mm) of rain fell across western Massachusetts, which combined with over 4 in (100 mm) that had fallen a few days earlier to produce widespread flooding. Flash flooding on the Chicopee River washed away the Chicopee Falls Bridge, while the Connecticut River flooded most of the Willimansett section. Residents of Ware were stranded for days and relied on air-dropped food and medicine. After the flood receded, the town's Main Street was a chasm in which sewer pipes could be seen. To the east, the surge left Falmouth and New Bedford under eight feet of water. Two-thirds of the boats sank in New Bedford harbor. Several homes washed away on Atlantic Boulevard in Fall River, whose foundations can still be found on the beach today. The Blue Hill Observatory registered sustained winds of 121 mph (195 km/h) and a peak gust of 186 mph (299 km/h), which is the strongest hurricane-related surface wind gust ever recorded in the United States. A 50 ft (15 m) wave, the tallest of the storm, was recorded at Gloucester. The storm entered Vermont as a Category 1 hurricane at approximately 6:00 pm EDT, reaching northern Vermont, Burlington, and Lake Champlain around 8:00 pm. Hurricane-force winds caused extensive damage to trees, buildings, and power lines. Over 2,000 miles (3,200 km) of public roads were blocked, and it took months for crews to reopen some of the roads. In Montpelier, 120 miles (190 km) from the nearest coast, salt spray was seen on windows. A train was derailed in Castleton. The storm killed five people in Vermont. Maple and sugar groves were damaged. The 1938 hurricane has been the only tropical cyclone to make a direct hit on Vermont in its recorded history; it remains the only one known to have struck Vermont as a hurricane. Even though the storm center tracked further west, through Vermont, New Hampshire received appreciable damage. As in Vermont, very high winds brought down numerous trees and electric lines, but rainfall totals in New Hampshire were significantly less than those in other states. Only 1 inch (25 mm) of rain fell in Concord. Damage at Peterborough was worse, however; total damage there was stated to be $500,000 (1938 dollars, $6.5 million in 2005), which included the destruction of 10 bridges. Much of the lower downtown burned because floodwaters prevented firefighters from reaching and extinguishing the blaze. Other communities also suffered considerable damage to forest resources. In New Hampshire, 13 people perished. At Mt. Washington, winds gusted to 163 miles per hour (262 km/h) and knocked down part of a trestle on the Cog Railway. In Maine, buildings and trees were damaged and power outages occurred. Storm surge was minimal, and winds remained below hurricane strength. The storm did not claim any lives in Maine. The western periphery of the hurricane brought heavy rain and gusty winds to Delaware and southeastern Maryland. Damage, if any, is believed to have been minimal. As the hurricane was transitioning into an extratropical cyclone, it tracked into southern Quebec. By the time, the system initially crossed into Canada, it continued to produce heavy rain and very strong winds, but interaction with land had taken its toll. Nevertheless, the hurricane managed to blow down numerous trees throughout the region. Otherwise, damage was generally minimal. ^ "The Great Hurricane of 1938 - The Long Island Express". Retrieved February 9, 2017. ^ a b Scotti, R. A. "Sudden Sea — The Great Hurricane of 1938". Boston: Little, Brown & Co., 2003. Archived from the original on January 2, 2007. Retrieved November 30, 2007. ^ "The Great Hurricane of 1938". The Boston Globe. July 19, 2005. Retrieved November 30, 2007. ^ Lane, F.W. The Elements Rage (David & Charles 1966, ISBN ), p. 16. ^ Lefebvre, Paul (October 19, 2016). 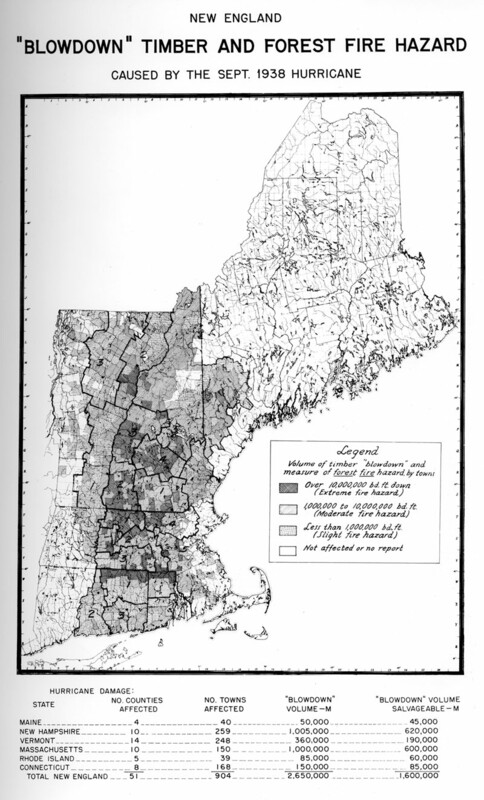 "How a hurricane changed New England's forests". The Chronicle. Barton, Vermont. pp. 1B. ^ Christine Gibson Archived December 5, 2010, at the Wayback Machine "Our 10 Greatest Natural Disasters," American Heritage, Aug./Sept. 2006. ^ Winds rotate counter-clockwise around all low pressure systems in the Northern Hemisphere. Winds on the right side of a hurricane (relative to the direction of the storm itself) are moving in the same general direction as the hurricane. Therefore, the forward motion increases the observed wind speed for points to the right of the eye of the hurricane and decreases the observed wind speed for points to the left of the eye. This occurs in a complex way that defies crude addition or subtraction of the forward motion from the intrinsic wind speed of the hurricane. ^ NOAA website: The Great new England Hurricane of 1938. ^ a b c The Weather Doctor Almanac 2008 The Great Hurricane of 1938: The Long Island Express Part 2. Retrieved August 20, 2013. ^ a b c d e f g h i j Service, US Department of Commerce, NOAA, National Weather. "The Great New England Hurricane of 1938". Retrieved February 9, 2017. ^ a b The Weather Doctor Almanac 2008 – The Great Hurricane of 1938: The Long Island Express Part 3. Retrieved August 20, 2013. ^ a b c d e f g h i Service, US Department of Commerce, NOAA, National Weather. "The Great New England Hurricane of 1938 - History". Retrieved February 9, 2017. ^ Hurricanes in History at the United States National Hurricane Center. ^ Ranked Using 2005 Inflation, Population, and Wealth Normalization. ^ The Deadliest Atlantic Tropical Cyclones, 1492–1996. ^ a b Damage Caused by Storm. ^ New England "Blowdown" Timber and Forest Fire Hazard Caused by the Sept. 1938 Hurricane Archived September 22, 2013, at the Wayback Machine. Retrieved August 20, 2013. ^ The Great Hurricane of 1938 | Peeling Back the Bark. Retrieved August 20, 2013. ^ a b Rather, John (August 28, 2005). "Dreading a Replay of 1938 Hurricane". New York Times. Retrieved November 28, 2012. ^ a b Flotteron, Nicole. "1938 'Long Island Express' Hurricane: could it happen again?". Home and Garden, Hampton.com. Retrieved November 28, 2012. ^ R, J. "The Long Island Express". weatherwise. ^ Woodlands, Northern. "One for the Ages: The Hurricane of 1938 Battered New England's Woods 75 Years Ago - Autumn 2013". Retrieved February 9, 2017. ^ "HABS No. NJ-1032" (PDF). National Park Service. Summer 1991. Retrieved May 19, 2018. ^ a b c "Catastrophe: Abyss from the Indies". October 3, 1938. Retrieved February 9, 2017 – via content.time.com. ^ a b "The Hurricane of 1938". Retrieved February 9, 2017. ^ "22 Sep 1938, Page 9 - The Brooklyn Daily Eagle at Newspapers.com". Retrieved February 9, 2017. ^ a b c d e "WGBH American Experience. The Hurricane of '38 - PBS". Retrieved February 9, 2017. ^ "Hurricane Loss Put at least $100,000,000 Long Island Press January 2, 1939" (PDF). ^ "Hurricane of 1938 May Still Be the Champ". September 3, 2010. Retrieved February 9, 2017. ^ 1938 Hurricane – September 21, 1938. ^ Weather History of the '38 Hurricane. ^ a b Baker, Joe. "'I was never so scared'". NewportRI.com l News and information for Newport, Rhode Island. Retrieved October 11, 2016. ^ "Prudence Island Light history". Retrieved February 9, 2017. ^ "The Charter of Brown University" (PDF). Brown University. 1945. p. 31. Retrieved April 10, 2017. ^ a b Bowman, Dennis (September 5, 2015). "Dennis Bowman: '38 Hurricane was no '100-year storm'". The Providence Journal. Retrieved September 8, 2015. ^ "Fox Point Hurricane Barrier Facts". providenceri.com. Retrieved September 19, 2013. ^ Glink, Ilyce (July 12, 2011). "Katharine Hepburn's Beloved Summer Home for Sale". CBS Money Watch. ^ Daily Discussion and Climate Summary — Tuesday, September 21, 2010 – Anniversary of Great New England Hurricane of 1938 from the Blue Hill Observatory, Milton, Massachusetts Retrieved August 20, 2013. ^ Nancy Bazilchuk (March 29, 1999). "Fire, floods, flu: Natural disasters in Vermont — At nature's mercy: Vermonters prove their mettle through floods, flu, and blizzards". The Burlington Free Press. Retrieved August 19, 2013. ^ New England Hurricane of 1938 Archived March 1, 2012, at the Wayback Machine in Maine. Retrieved August 19, 2013. ^ Long Island Express Hurricane – September 1938 from NOAA. Retrieved August 20, 2013. ^ Nicholas K. Coch (2005). "Hurricane Hazards in the Northeast -A Re-appraisal based on recent research". Fairfield University. Archived from the original on September 4, 2006. Retrieved May 20, 2009. ^ Staff Writer (September 7, 2005). "History of Tropical Cyclones in Canada". Canadian Hurricane Centre. Archived from the original on October 2, 2006. Retrieved May 20, 2009. Goudsouzian, Aram (2004). The Hurricane of 1938 (PDF). New England Remembers. Beverly, Mass. : Commonwealth Editions. ISBN 9781889833750. Aviles, Lourdes B. (2012). Taken by Storm, 1938: A Social and Meteorological History of the Great New England Hurricane. Burns, Cherie (2005). The Great Hurricane: 1938. New York: Atlantic Monthly Press. ISBN 0-87113-893-X. Goudsouzian, Aram. "'What Do You Do with a Disaster?' Providence and the Hurricane of 1938", Rhode Island History (September 2004) 62#2 pp. 26–48. Scotti, R. A.; Allen, Everett S. (2003) . A Wind to Shake the World: The Story of the 1938 Hurricane. Boston: Little, Brown & Company. ISBN 0-316-03426-6. Scotti, R. A. (2008). Sudden Sea: The Great Hurricane of 1938. Boston: Little, Brown & Company. ISBN 0-316-73911-1. Wikimedia Commons has media related to New England Hurricane of 1938. National Hurricane Center, Brian R. Jarvinen Storm Tides in 12 Tropical Cyclones (including four intense New England hurricanes).